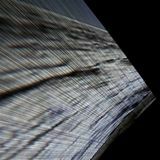 Video documentation by Jo Millett. 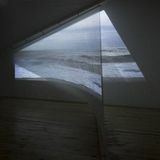 A three-dimensional video sculpture reflecting the fragility of a historic coastline and subtly recalling centuries of slowly shifting sands. 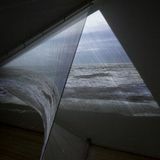 This piece has been produced in close co-operation with Jo Millett (video) during an artists' residency at Spurn Point on the Humber Estuary. 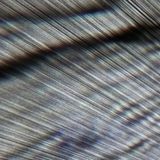 Seascape [Fr-Agile] features footage of Spurn's North Sea shore, showing the horizon line and the ever rolling movement of the incoming tide. 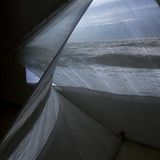 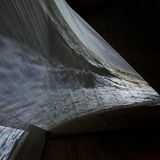 The video is projected onto a curved semi- transparent screen made of unwoven silk threads, stretching between wall and floor. 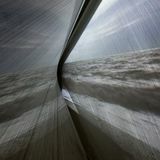 The projection spreads through the warped screen to the wall behind thus creating both a plane and a three-dimensional distorted image. 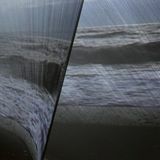 The superimposition of these two images reflects the shifting movement of Spurn peninsula over centuries. 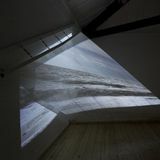 The footage projected on the curved screen is taken from the documentation of a performance about Spurn's shifting movements over the past 150 years, Fr-Agile.